How exciting to return home after a particularly brutal day at work to find a package from California. 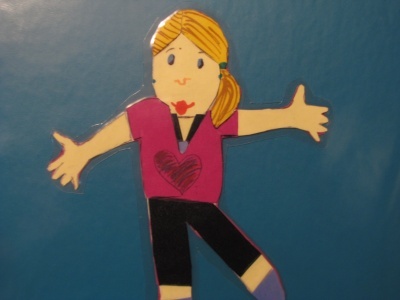 Flat Sapphire [Ravynn’s Flat person] had been on a several week trip to Lake Elsinore, California where they spent time with Lauren and Nicholas. She came home with a lot of gifts for the girls, which were incredibly appreciated. 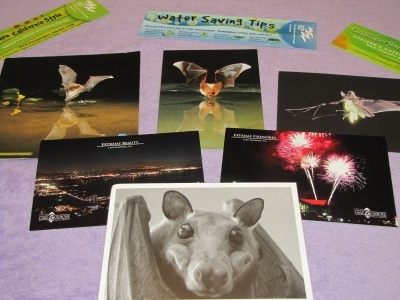 We tried to get photos of them all, but realize we forgot to photograph the CD-R of Sapphire’s Travel Journal. That was a great addition that we look forward to sharing with you. Included in the packet with the journal were two really cool tshirts with tarantulas and and animal footprints decorating them, two pair of sunnies [Ravynn is modeling them in the photo with Sapphire], a flash drive, frisbee, and a lot of postcards and travel magazines/books. The girls are really excited to dive into them. We tried to copy some of the pictures from the journal into this post, but I’m not that adept at working with PDF files. And I don’t want to insert the whole thing as there are pictures of minors who aren’t mine. The girls wanted to take a walk around town looking for Walking Men Project statues. As we hunted around AU for their contribution, the girls took the opportunity to walk the fountain. Ravynn was a little more sure of her footing than Whisper was. No matter where you go in Anderson, you WILL be stopped by a train. When we stopped for our third of the day, we decided to take a picture. More nature at Shadyside. I love when ‘in color’ photographs look black and white. Flat Stanley [from Cali] with the big grafitti eyeball we found in an alley downtown. Researching and writing at Panera. In fact, those are my plans for today as well. 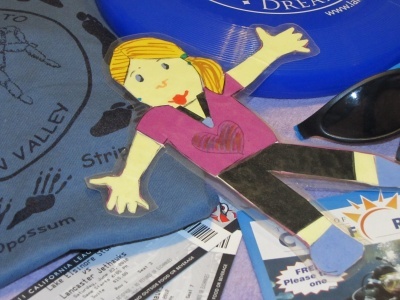 Our Flat People have hit the streets via Priority Mail and are off toward their destinations. We’re waiting patiently for their arrivals, but we wanted to update you on their plans. 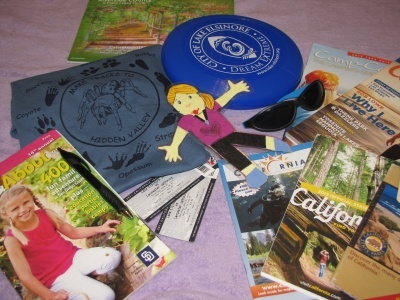 Flat Sapphire has made her way to California. She’s very excited as Cali was on her “must visit list”. She is looking for a place to visit after she returns. Flat Spring is on her way to Valparaiso, Indiana. She’s visiting old famly friends and we wish we could have gone with her. She is also looking for a place to visit after she returns. 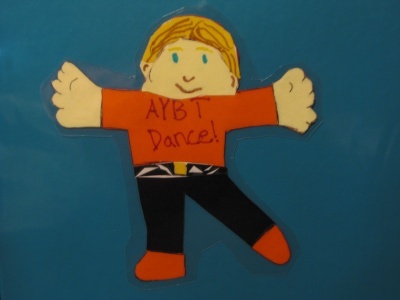 Flat Stefan is travelling with Alek to Texas and then is heading to New York City. The flat dancer is looking forward to this artistic journey. He will be looking for a place to visit after he returns. Flat Jordan was also lucky enough to find a host in one of his dream locations. He’s on his way to France and we can’t wait to share his adventures. 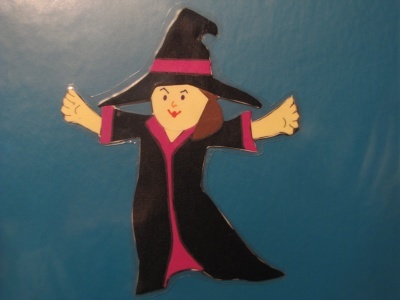 Flat Ophelia is on her way to Massachusetts. I don’t know how close she is going to Boston or Salem, but hopefully it’s not too far and she can check a dream destination off her list. The Flat Gothlings had initially scheduled a trip to New Hampshire with plans to make a road trip to New York City. I just got an email from the coordinator of this trip who reported interest in flying the Flat Gothlings to Afghanistan to visit with the father of one of the girls in the NH group. They might be gone for awhile, but that’s okay. 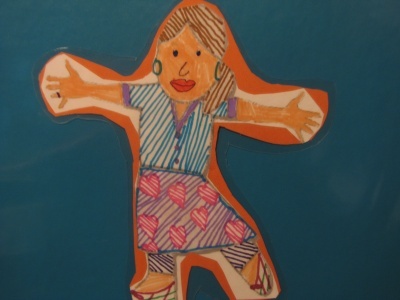 I don’t remember when I first learned of Flat Stanley. 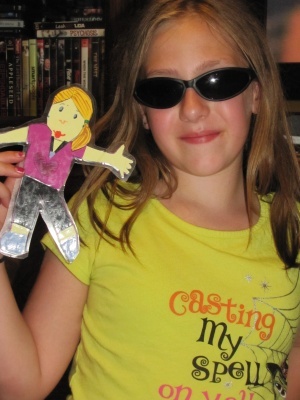 I’ve never read the books and the kids have never done Flat Stanley projects for school. I suspect a friend mentionned it or it was featured on one of the blogs I follow. I do know that it’s popped under my radar several times since then and several times I thought about doing a home version. Neither of the boys were especially interested and the project was too intended for their benefit for me to do all the work. Ravynn and Whisper, however, are incredibly interested. 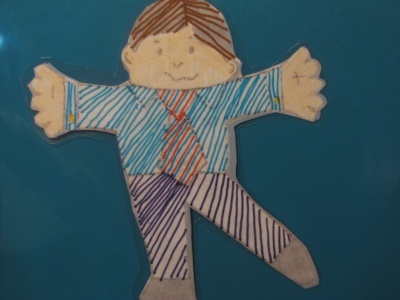 So far, they’ve designed Flat Stanleys for themselves and one for each of their brothers. I have one ready for me and the girls have completed the pair that I was going to do. We have trips scheduled for a couple of them and are signed on to serve as a host family for someone else. We really look foward to that. After browsing the website, it seems there aren’t rules so much as suggestions, so it’s up to each participant to decide how they want their Flat experience to go. I’ve talked with the girls and at this point, this is the plan. Plan visits for 1-2 weeks. Create a binder to hold the travel logs and signature pages. 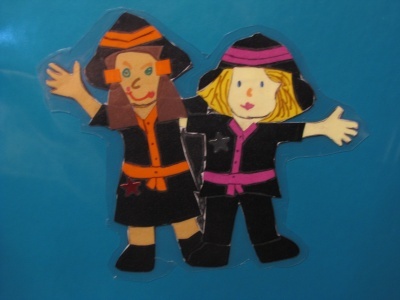 First, though, let me introduce our Flat People to you. If you know anyone who would be interested in hosting one of our Flat People, please let us know.